Donald Trump’s NH poll lead: Monmouth survey suggests Trump wasn’t slowed by McCain comments. 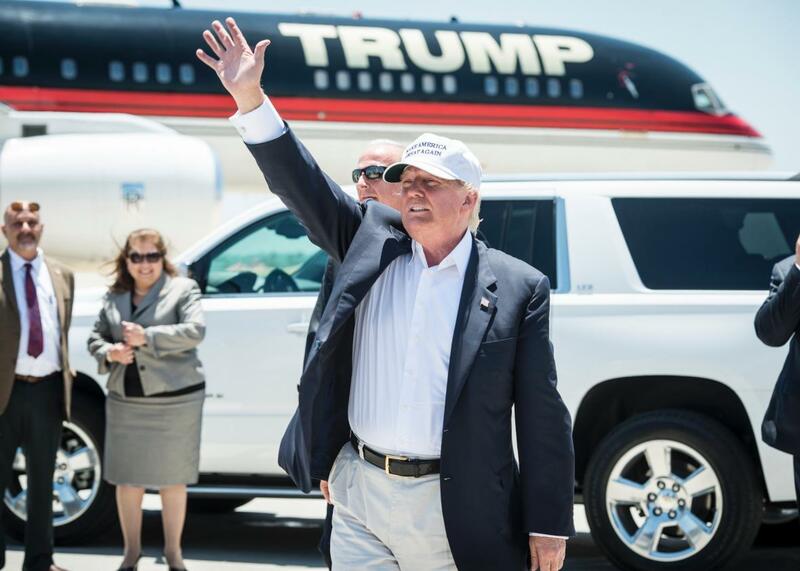 Donald Trump exits his plane during his trip to the border on July 23, 2015 in Laredo, Texas. Donald Trump’s newest reality show isn’t over yet. A new Monmouth University poll in New Hampshire—the first conducted in the state after Trump did his real-war-heroes-don’t-get-captured shtick—shows the real estate tycoon with a commanding 2-to-1 lead over his nearest rival, Jeb Bush. “The controversy over comments about John McCain’s war service do not appear to have slowed the Trump steamroller,” said Patrick Murray, the director of the university’s polling institute. Trump’s lead was outside the poll’s margin of error—a relatively rare feat given the crowded field and the sample size—but the usual caveats about making too much of a single poll taken this far out from an election do apply. Still, as opposed to an outlier, the new poll is largely more of the same for Trump. He was trending upwards in New Hampshire in the days before his McCain barb, and currently holds a lead of nearly three points over Bush in an average of the five most recent state polls tracked by RealClearPolitics. It’s also a similar story nationally, where Trump holds an average lead of 4.5 points over Bush, 6.5 points over Walker, and 11.4 points over Rubio. In a national CNN poll conducted in the days immediately after Trump’s McCain comments, Trump led Bush by 3 points and Walker by 8. Those numbers don’t tell us how The Donald will fare come 2016, but they do tell us that his particular package of outsider status and bloviated belligerence is currently appealing to a certain subset of GOP voters. Trump’s long-term fundamental problems remain, though. Unlike many of his rivals who are viewed much more favorably by Republican voters, Trump generates mixed feelings. That reality was again on display in the Monmouth poll: 47 percent said they held a favorable view of him, while 44 percent said they had an unfavorable one. (For comparison, Walker posts a 57-16 split on the favorability question.) Still, 8 percent of respondents listed Trump as their second-choice for the GOP nomination, suggesting that the brash billionaire is not entirely the love-him-or-hate-him candidate he’s often portrayed as. The Monmouth poll also paints an interesting picture of what New Hampshire would look like in a world without Trump. If the celebrity businessman were not in the race, more than 4-in-10 of his supporters say they would be backing Chris Christie, Scott Walker, or Ted Cruz—all three of whom would likely pick up 3 to 4 additional percentage points, according to the pollsters. But for now, the world we’re all living in is one that Trump is very much a part of. Don’t expect that to change until the GOP field narrows enough for the establishment favorites to consolidate support and push Trump down the polls—and out of the race.